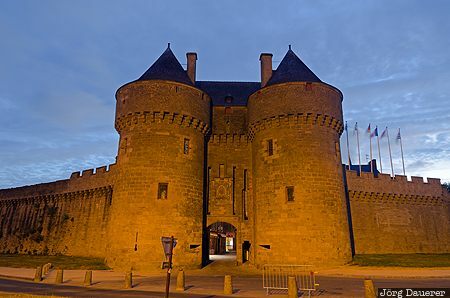 The flood-lit Saint-Michel Gate (La Porte Saint-Michel), one of the four gates of the medieval wall surrounding the city Guérande at the blue hour just after sunset. Guérande is in the department Loire-Atlantique (just south of Brittany) in the north-western part of France. This photo was taken in the evening of a rainy day in May of 2011. This photo was taken with a digital camera.